LIUNA members in Miami, Florida, out of LIUNA Local 1652, earned a local hire victory with the unanimous passage of the “Residents First” ordinance, which urges contractors to hire at least 51% Miami-Dade residents on county construction projects of $1 million or more. This effort was spearheaded by Local 1652 and the Build 305 campaign, a community initiative of the Southeast Laborers’ District Council (SELDC). “This ordinance puts in practice measurable objectives that ensure local residents have a shot at a career in the construction industry. We look forward to continue working with our partners in the community, the Mayor and all Commissioners to successfully putting to practice this legislation,” said SELDC’s Miami-Dade Political Director, Matthew Land. 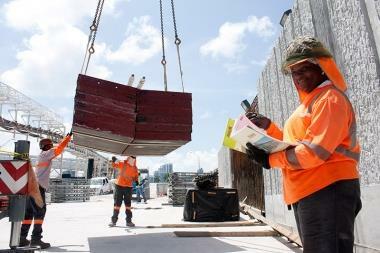 The program sets a goal of contractors hiring Miami-Dade residents for at least 50 percent of all jobs on the contract. And while the target isn’t mandatory, commissioners want the county’s procurement division to weigh companies’ local hiring under the program when considering future contract awards. Local 1652’s members had a similar win with the Port of Miami Tunnel project, on which 87 percent of workers were local Miami-Dade County residents. That project has been underway for over three years, and has put over 300 LIUNA members to work.